A space to share my latest experiments in cooking, (mostly!) healthy eating, and enjoying conversation around a table. 1. In a large bowl, dissolve the yeast in 1/4 cup lukewarm water. Add 1/4 cup flour and the sugar; stir together. Cover with plastic wrap and let rise in a warm place for 20 minutes. 2. Stir the remaining 1 cup lukewarm water, 3 cups flour, the cornmeal and salt into the yeast mixture. Combine the butter and garlic; mix into the dough. Turn out onto a lightly floured work surface and knead until soft and elastic, 10 to 12 minutes. 3. Lightly grease a large bowl, add the dough and turn to coat. Cover and set in a warm place until the dough is doubled in size, 1 hour. 4. Punch down the dough, then knead for 2 to 3 minutes. Grease a 9-by-13-inch baking pan, then press in the dough to cover the bottom and 2 inches up the sides; let rise for 20 minutes. 5. Preheat the oven to 500°. 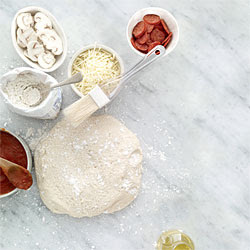 Top the pizza dough with your favorite toppings. Lower the oven to 450° and bake for 30 minutes. Learning to slow down and savor the simple things in life such as the sound of my baby niece babbling on the other end of the phone, a glimpse of Mt. Rainier peeking through the clouds, a glass of red wine, a perfectly steamed latte, uninterrupted time in my kitchen, and beautifully written novel. Picture Window theme. Theme images by 4x6. Powered by Blogger.